The Supreme Court Bench consisting Chief Justice P. Sathasivam, Justice R.M. Lodha, Justice H.L. Dattu and Justice S.J. Mukhopadhaya commuted the death sentence of Devenderpal Singh Bhullar, the 1993 Delhi bomb blast convict by allowing the curative petition filed by his wife. The rationale for commutation was due to the delay of eight years in disposing his mercy petition and his mental illness. The medical reports say that Devender Pal Singh Bhullar suffers from schizophrenia. In Shatrughan Chauhan & Anr. vs Union Of India & Ors. dated 21 January, 2014 the Court ruled that “unexplained and inordinate delay in deciding the mercy petition is a ground for commutation of death sentence to life imprisonment”. The events which lead to the decision have been summarised chronologically. September 1993: Bomb blast in New Delhi killed nine persons and injured 25 others, including then Youth Congress president M S Bitta. January 1995: Devenderpal Singh Bhullar was arrested under the Terrorist and Disruptive Activities (Prevention) Act (TADA). August 2001: Devenderpal Singh Bhullar convicted for death penalty. December 2002: Dismissal of Review Petition filed by Devenderpal Singh Bhullar. January 2003: Devenderpal Singh Bhullar filed Mercy Petition before the President of India. March 2003: Rejection of Curative Petition by Supreme Court. May 2011: Mercy Petition dismissed after a delay of over eight years. June 2011: Writ Petition filed by the wife of Devenderpal Singh Bhullar for quashing the communication of dismissal of Mercy petition. April 2013: The apex court holds that unreasonable delay of 8 years in disposal of mercy petition one of the grounds for commutation of death sentence to life imprisonment as per the established judicial precedents. March 2014: The Central government intimates the Supreme Court that it has no objection for commutation of death sentence into life imprisonment. 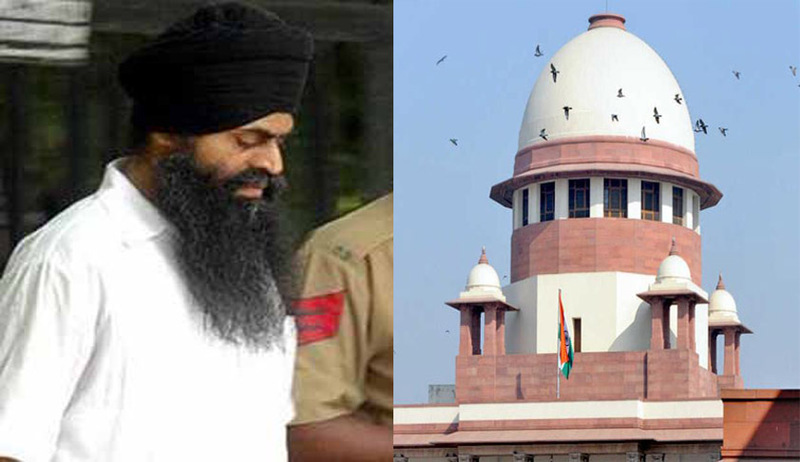 31st March 2014: The Supreme Court allows Curative petition commutes the death sentence imposed on Devender Pal Singh Bhullar into life imprisonment both on the ground of unexplained/inordinate delay of 8 years in disposal of mercy petition and on the ground of insanity. In the Judgment delivered today it is said that “Learned Attorney General, taking note of the conclusion arrived at in Shatrughan Chauhan (supra) wherein this Court held that the ratio laid down in Devender Pal Singh Bhullar vs. State (NCT) of Delhi (2013) 6 SCC 195 is per incuriam, fairly admitted that applying the said principle as enunciated in Shatrughan Chauhan (supra), death sentence awarded to Devender Pal Singh Bhullar is liable to be commuted to life imprisonment. We appreciate the rationale stand taken by learned Attorney General and accept the same”. “1.The patient has been diagnosed with Severe Depression with Psychotic features (Treatment Refractory Depression) with Hypertension with Dyslipidemia with Lumbo-cervical Spondylosis with Mild Prostatomegaly. 2. He is currently receiving Anti-Depressant, Anti-Psychotic, Anti-anxiety, Anti-Hypertensives, Hypolipedemic, Anit-Convulsant (for Neuropathic pain) and Antacid drugs in adequate doses along with supportive psychotherapy and physiotherapy. 3. Patient has shown partial and inconsistent response to thetreatment with significant fluctuations in the severity of his clinical condition. 4. The treatment comprising of various combinations of pharmacological and non-pharmacological treatments have brought about partial and inconsistent improvement in his clinical condition in the last three years of hospitalization. The scope for effective treatment options is limited and thereby the chances of his recovery remain doubtful in the future course of his illness”. The court rules; "The above report has been signed by the Director & Chairman as well as four Members of the Medical Board. The report clearly shows that he is suffering from acute mental illness. The three-Judge Bench in Shatrughan Chauhan (supra) held that insanity/mental illness/schizophrenia is also one of the supervening circumstances for commutation of death sentence to life imprisonment. By applying the principle enunciated in Shatrughan Chauhan (supra), the accused cannot be executed with the said health condition".